Sony also brought out two mounts for you smartphone - a tripod and the Smart imaging stand. Both of them clamp the phone so you don't need the tripod mount of the QX lens-style cameras. The Smart imaging stand features NFC and promises to help the Xperia Z1 recognize smiles and you to capture photos without having to hold the phone. 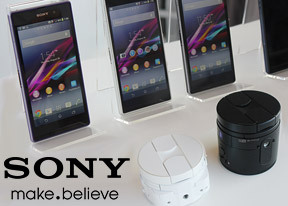 Sony brought back the SmartWatch 2 that was announced alongside the Xperia Z Ultra. It made sense then (the Z Ultra is a little too big to pull out of your pocket to check every SMS and tweet) and it makes even more sense now in light of the lens-style cameras. The watch is almost like a detachable screen - you can check incoming messages, accept, reject or mute incoming calls, control the music player, use it as a remote viewfinder, see upcoming calendar events, check your RSS feeds or the weather. That's just the list of default apps, third party developers can extend the functionality further and put apps on the Google Play Store. The SmartWatch 2 is just at home in the Xperia lineup, it's based on the OmniBalance design which calls for an angular look with prominent metal and glass elements and the round power button (which was originally meant to resemble the crown on a luxury watch). On the hand it feels almost like a regular watch - it's not round like the majority of watches, but you'll quickly get used to it. It has an IP57 rating, so it will survive daily encounters with the elements (rain, washing your hands) but you shouldn't put it under water. The watch weighs 122.5g - it sounds like a lot, it's as much as smartphones weigh, but to be fair a light metal watch will feel cheap. And like a regular watch you can attach any standard 24mm wristband - there's one in the box and Sony offers a several bold colors, but you can put on a classy metal or leather band too. This is a smartwatch, so you get capacitive touchscreen plus Back, Home and Menu keys. The screen is 1.6" big and has 220x176 pixels resolution (176ppi). It's a transflective LCD, meaning it has better sunlight legibility than LCD's on smartphones. The watch faces are customizable so you can change them daily to match your mood and outfit. The SmartWatch 2 uses NFC and Bluetooth 3.0 to pair and communicate with any Android 4.0+ smartphone. Even though it's not using the low-power Bluetooth 4.0, Sony is still promising 3-4 days of normal usage with the watch always on. The watch can function even without a smartphone - you lose the "smart" functions, but you still get alarm, timer, stopwatch and even a compass.